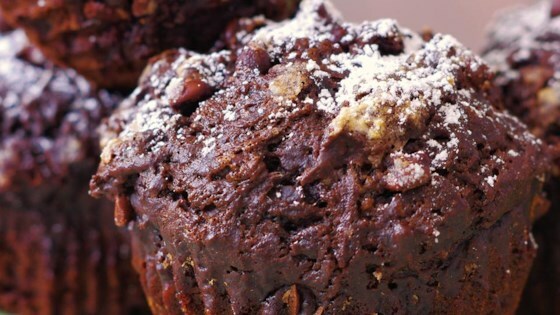 "These muffins are so moist and full of flavor! I have looked at dozens of recipes and most had too much sugar for my liking. There is absolutely no need for a lot of sugar to make these muffins delicious. Because they have bananas and chocolate chips, I just added 1/2 cup of sugar, which turned out perfect!" Preheat the oven to 350 degrees F (175 degrees C). Line a muffin tin with paper liners. Combine flour, cocoa, baking powder, baking soda, and salt together in a large bowl. Whisk sugar, oil, egg, milk, and vanilla extract together in a separate bowl. Stir into flour mixture until just moistened. Fold in bananas and chocolate chips. Divide batter among the muffin cups, filling each about 3/4 full. Bake in the preheated oven until a toothpick inserted into the center comes out clean, 20 to 25 minutes. Substitute yogurt for the milk if preferred. These are so good, I might never make banana bread again. I used applesauce instead of oil (saving it for my friend's popcorn later) and these were easy, moist and very flavorful. Great additional way to use ripe bananas! This one is a definite keeper. I generally cut the sugar anyway so this was perfect to me. Very moist. I put in a tsp of cinnnamon but couldn't taste it. These are great as they are! Delicious!! My family and I loved them!! Awesome. No changes. Good way to use up bananas. No banana taste just very moist.